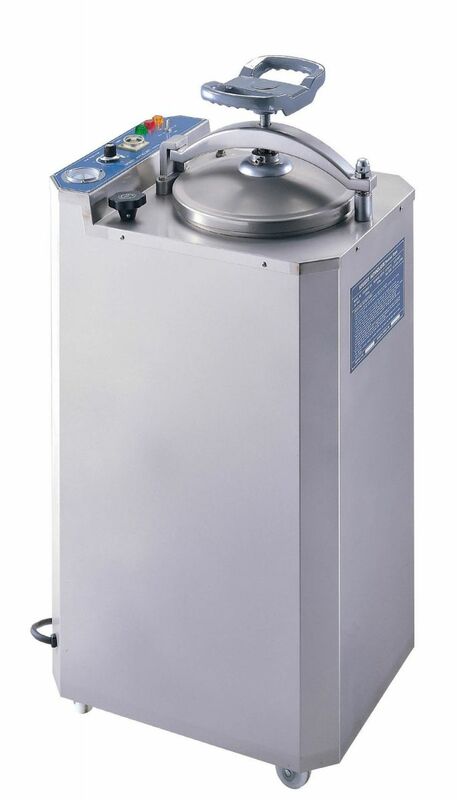 Vertical type steam sterilizers have space-saving, easy operation, durable, large capacity… features. 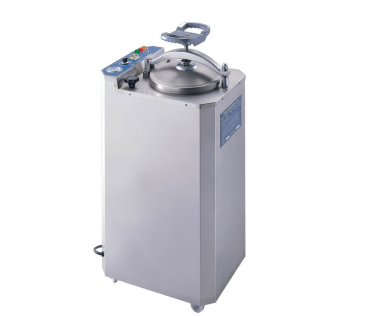 STA-400/STA-410 vertical type steam sterilizers have space-saving, easy operation, durable, large capacity… features. Designed for clinics and laboratories with versatile sterilizing needs and where objects are to be sterilized such as: test tubes, glassware, liquids, surgical instruments, garments, human waste products etc. 1. Semi-automatic control system by position sterilizing-drying switch to work sterilizing or drying function. 2. Sterilize temperature is adjustable from 121 degree C to 132 degree C on temperature regulator. 3. Sterilize time and drying time is adjustable from 0~60minutes on timer. 4. The timer starts only after the pre-set temperature is reached, ensuring complete sterilization. 5. Illuminated pilot lamps display status and a buzzer announces the completion and cuts off the heating power source. 6. The pressure-temperature gauge make ideal require reading and indicate high precision and consistent results. 7. Integral heating system is equipped with a high efficient immersion heater and temperature switch to provide strict control of heating temperature. 8. Specially designed drying device to ensures efficient heating and drying functions. 9. Automatic air venting device discharges cool air from chamber to obtain effective saturated steam. 10. Chamber door is manually operated and actuated by rotating a door handle. 11. The silicone-rubber sealing gasket is applied to an even pressure door seal. 12. Cylindrical chamber provides a large capacity to satisfy a wide range of sterile processing needs. 13. Chamber is made of high quality SUS 304 stainless steel with polished surface for long lasting service and easy cleaning. 14. Four heavy-duty castors are mounted for convenient movement. 1. Safety valve: releasing steam in case of excessive chamber pressure. 2. Overheating protection device: high temperature deviation in chamber actuates protective device cuts off the heating source immediately. 3. Circuit protection device: circuit breaker protects control units when short circuit or overload occurs. 4. Emergency exhaust: manual exhaust to vent the chamber and remove the load in the event of a power outage. Copyright © ST.FRANCIS MEDICAL EQUIPMENT CO., LTD.